Just a quick blog post documenting some solutions to problems I’ve had since installing iOS4 on my iPhone. More for my own records in case I need to do this again. But hopefully these tips might help others out there too! When reconfiguring my iPhone to get emails from iiNet’s IMAP server, it seemed that the iPhone kept on detecting the iiNet mail server as POP and not IMAP. This frustrated me on no end – I’m SURE I had the email address correct but I just couldn’t find a place to convert the iiNet server from POP to IMAP. For some reason, even though I entered the correct username and password to access my GMail account, it was not logging in successfully. I was getting the error “The user name/password for IMAP is incorrect”. However, when I tried the same user name and password on the web interface, it worked?!?! Seems that Google was not letting my iPhone in. Here’s what to do to allow the iPhone to successfully log in. After upgrading, I lost all my contacts. Luckily, my contacts are stored on GMail so it’s just a matter of pulling them back down again from the “cloud”. After configuring GMail, I still did not have any Contacts!! I’ve come to realise there are TWO ways to sync GMail onto your iPhone and only the Exchange (Google Sync) method transfers Contacts at the moment. But there is NO contact sync’ing!?!? WTF? If you configure your GMail account using the Exchange method (called Google Sync), then you WILL get Contact sync’ing, but no Notes sync’ing. I guess if you want the best of both worlds, you can use both methods to get it all. Just over a week without internet. In the last few days, I’ve definitely had withdrawal – not easily being able to find out the weather, news or just look up random facts. The funniest thing was hearing little Miss 8 say one day when talking about some weird zoo animal, “We can look it up on ther internet! Oh wait, we don’t have any internet at the moment :(“. In the end I chose BoB. I just thought – replacing 3 boxes with 1, getting wireless N speeds and range and the USB port was enough to push me over the edge from just getting another ADSL2 modem. It arrived by courier yesterday after only 4 business days from ordering. Not bad. The black box emblazened with the name BoB looked quite nice. Inside was the modem router, telephone and LAN cables, an inline filter and some documentation. I decided to be a good boy and actually follow the manual to set it up. An even nicer surprise was that my ADSL sync speed was now around 15000 kbps instead of around 8-9000 kbps previously, and the ozspeedtest clocked my download speed at around 12Mbps instead of 4-5Mbps. Sweet! I’m not sure why my old D-Link didn’t sync or download as fast, but maybe a combination of newer hardware and less boxes helps. I immediately changed the wireless SSID and security and then changed all the other wireless devices in the house to the new settings, and was happy to see the Tivo retrieve its TV guide again. I was quite excited about the USB storage port. I googled around and found a newer firmware on the internet that I downloaded and flashed. The first thing I plugged in was a Western Digital Passport hard drive. Nothing. No USB storage device recognised. I remembered that I sometimes had problems with this drive, maybe because it’s USB bus powered. I wonder how many volts the BoB USB port puts out and if it’s enough to drive USB powered devices. The next thing I tried to plug in was a Western Digital MyBook 1TB drive. This one is powered from the mains, and it was recognised with no problems! I was able to connect to it from my Mac OSX too. Unfortunately, when I tried to create a new share folder on BoB, and tried to browse the device for the root folder path, the whole thing just seemed to lock up. The admin web page didn’t return. I wonder if BoB was still trying to traverse the zillions of folders and files I had on my 1TB drive. Not impressed. So for now, I’m just sticking with the default root folder share. It’s not a USB print server, and doesn’t support USB hubs (yet), and doesn’t support DLNA so it’s really not a proper NAS at all, but it’s a good start. Definitely recommend this modem router for a typical non technical “Mum and Dad”. I was pleasantly surprised how it just worked without any custom configuration, but strongly recommend anyone using it to configure a different SSID and set up wireless security (unless you don’t mind other people using your internet connection!). The only downside for me was the price. A few years ago I tried to build a MythTV box. Which obviously meant playing around with Linux. (For those who haven’t heard of it – MythTV is basically a software program that makes your PC be like a PVR.) Back then, it was my third time playing with Linux, so I knew the basics, but after a month of trying to get my TV card (homebrew drivers! ), graphics card (never seemed to work right), wireless card and networking (what! text files calling iwconfig!?!? ), sound card (ALSA? ), TV Guide and other stuff working, I just gave up. It was just too hard. I was spending hours configuring text files for X and networking and other things without really knowing what I was doing… I was trying to get Linux to work by Googling. I really think a lot of this stuff should be able to be configured without having to go to the command line. I know it may sound totally noobie, but why does Linux have a plethora of text configuration files? It’s been around for so long, you’d think someone would have made it easier to use. Anyway, just recently my old Dell Inspiron 630M laptop’s Windows install got corrupted, so I thought – why not try and make it a MythTV box for playing videos now that my PS3 is out of service for a while. After all, things should have improved in 4 years right? Yes… and no..
To save time, I looked for a distribution that was tailored with both the OS and MythTV. I decided to get Mythbuntu, downloaded it, burnt the ISO onto a CD, popped it in and rebooted. No problems – it came up with the Live CD version of the OS and asked me if I wanted to install the OS onto the Hard Drive. I said yes and was pleasantly surprised with the usability improvements in the setup. The partition tool worked with no problems, I just had to choose easy things like timezone and user account name. Thumbs up to the Live CD concept. But once it came to MythTV configuration, things went too hard again. This time I have no TV card, so that’s one thing to not worry about. But lately I’ve converted a lot of the kids’ movies onto an external USB hard drive. I want to be able to play the movies off that in MythTV. Unfortunately, in MythTV’s initial configuration, I was faced with ’Videos’ Storage Group Directories with a default setting of /var/lib/mythtv/videos. To the average user – what the heck is that? Why isn’t there a folder picker here? What is the path to my USB hard drive? Why can’t my USB hard drive be picked up automatically by MythTV? After some mucking and googling around, I found that it could be something like /media/USBHDDName but made a mistake and ended up with just a / as the path. And I could not figure out how to delete my wrong entry. I tried the Delete button, Backspace button, pressing Space for the menu. Only after more mucking around did I find that the “d” key was to delete it. Looking through the General Options, some settings are self explanatory like “TV fomat” and “Your Local Timezone”, but unfortunately most of the settings require detailed Linux or MythTV knowledge. I mean, what is EIT Transport? And all the commands like “Backend Stop Command”, “Commercial Flagger command”, etc are all Linux commands that a Linux newbie would have absolutely no idea. I googled around for automatically mounting a USB HDD and came across suggestions for adding entries to /etc/fstab. Now – that is definitely something a user should NOT have to do either. And editing the file using the default Mythbuntu text editor of Mousepad will not work either. Users will need to use sudo to edit a system file like /etc/fstab. In the end I did find another workaround not requiring any command line interaction – quit MythTV, double click on the USB HDD icon on the desktop which seemed to mount it and then restart MythTV. Or, just plug in the USB HDD after Linux had booted up! The other inconsistency I found on my first use – the directories for videos in the initial MythTV setup did not appear in the MythTV Setup itself (under Utilities/Setup -> Setup -> Media Settings -> Videos Settings -> General Settings. Was I confusing the back end with the front end setup? I know there will be Linux enthusiasts who will defend it saying that I just don’t know enough about Linux. Or others who will say I should have read the “seems to be written by a developer” User Manual. But you know what – MythTV has heaps of potential, has more functionality and is more customisable than any other PVR out there. It could be so much more widely adopted, if it was just easier to setup and install. Perhaps “they” should do some Usability Lab testing on it? Also, it’d be great if I could get the MythTV box on my home wireless network. Again, not being familiar with Linux, I couldn’t find any menu item to connect to my wireless network at home. I had to resort to Google and the first few pages I found seemed to indicate that the situation had not changed at all since I last played with wireless networking on Linux. But then I looked around the Mythbuntu Xfce desktop again and saw a Wireless networking icon in the top right – I was saved! I connected to my home network, put in the WPA password, created a Key Ring and I was connected. Seemed much easier than my last experience! Well, it was now finding my movies on my USB HDD. But it seems some of the later High Definition ones weren’t playing properly. The sound was coming out at too low a pitch – almost if MythTV was playing the sound at the wrong sampling rate. VLC played them fine though. I don’t know what is going on here and I haven’t been able to sort it out yet. I’m guessing I might need to change the video player used by MythTV? Time to read the MythVideo documentation more I think. After this, other things I need to do include connecting the laptop to the TV, adding a video folder from a network path and then making sure the kids and Wifey can use it. It’s not all finished yet. But the experience was definitely better, faster and less painful than last time. I guess it was also easier this time because I was not setting up a TV card. I think Linux distros still have a long way to go before they can be used by the general public and newbie computer users. I’m not the only one who’s tried and been frustrated (eg. http://www.tf2.org/?q=node/170). At least the installation is getting easier. I remember the pain of old Slackware distributions years ago, trying to configure X11 by trial and error in text files. That was definitely not fun. I liked how the Wireless networking just worked – the way it does on Windows and Mac OSX too. As mentioned above, some Usability Lab testing would greatly benefit. As well as reworking the configuration/setup screens to that options are easily understandable in easy English, use of file/folder pickers and no weird acronyms that require Googling for basic configuration would be good next steps. I don’t want to need to use the Internet to set up a MythTV box. Well, I finally succumbed. The day before the Olympics, we took a drive to Harvey Norman and bought a Tivo. I couldn’t decide for a while whether it was worth it as there are other PVRs like the Topfield now at an affordable price, but it was the difference in the approach to recording TV that I have been spoilt with previously (with MythTV) that I wanted. After putting the kids to sleep, I finally got to unpack it. Here’s the red “friendly” box and the Tivo USB wireless adapter so that I can connect it to my wireless home network. It comes with a standard set of cables. But it’s disappointing that a system designed for Digital TV has no optical cable and no HDMI cable included. Harvey Norman tried to sell me extremely expensive Monster cables, but I had said no – I had spares at home. Alternately, I could’ve bought extras off eBay for much less. I had a peek at the back of the Tivo. 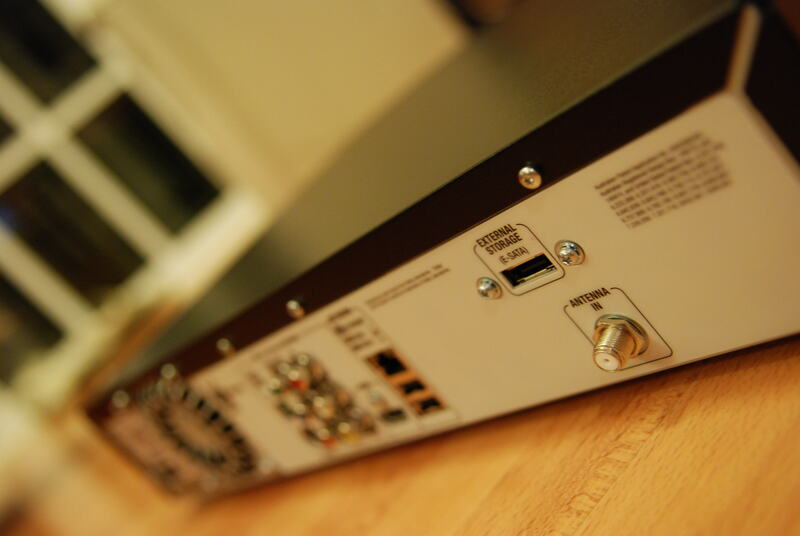 Nothing unusual here – but there is no coax digital audio connection. There is a fan on the back for cooling. It was good to see an eSATA connector for future expansion, but I believe it is disabled in the current firmware for the Australia box. 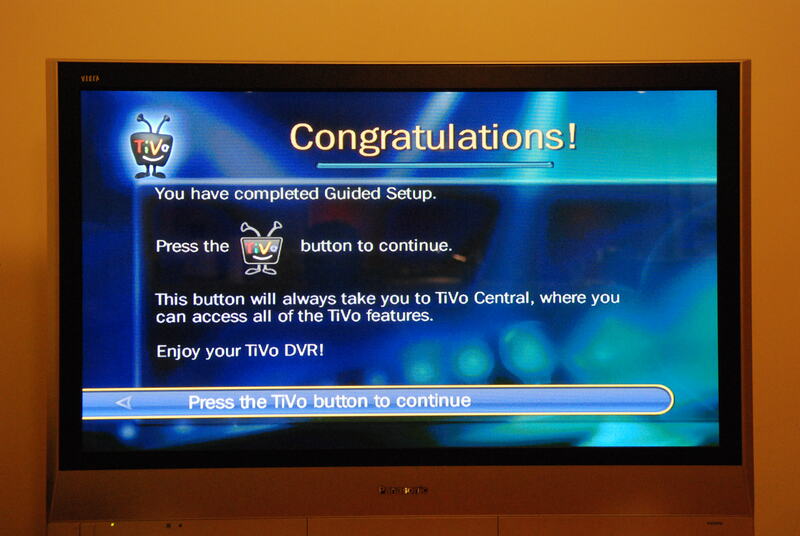 Tivo and Seven – PLEASE don’t make us pay for firmware upgrades in the future!!! Also, there is only a single antenna in socket and no RF out. No big deal – you just have to place it on the end of your antenna chain. The Tivo is surprisingly “big”. 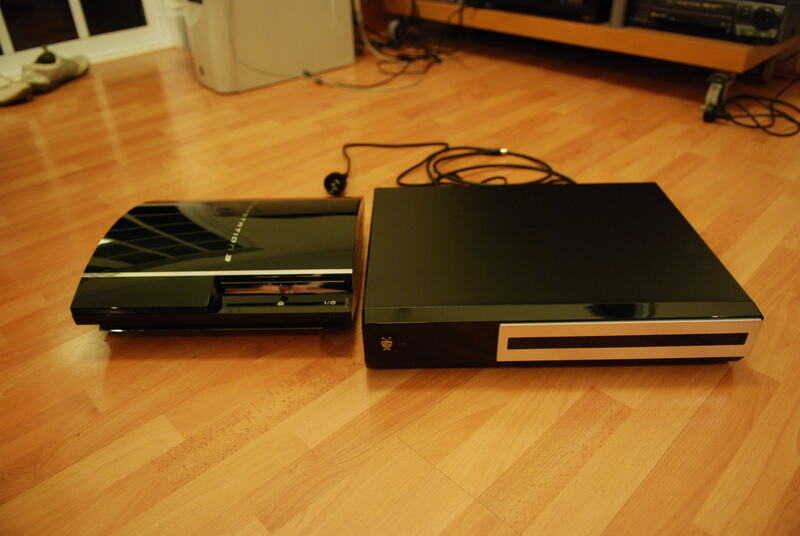 Here it is next to the PS3, which already is quite big. So what next? I connected it all up using the easy to follow instructions, turned it on and followed the configuration wizard and 24 minutes later.. it all worked out of the box!!! I was SO HAPPY! No wireless drivers to install, no ifconfig or iwconfig to run, no worries about Nvidia or ATI drivers, no need to think about what file system type to use, no need to determine what Graphics card chipset and CPU combination required to record and playback high definition video, no need to install IR drivers or set up perl scripts to download the latest TV guide – IT JUST WORKS! And just in time for us to watch, pause and replay the Olympic opening ceremony last night. And tape Star Wars – A Phantom Menace in high def at the same time. And this morning, the kids were up early and worked out how to watch the opening ceremony again. One guy, three girls is a mashup of technology, parenting, music, photography and life in a household with two daughters and a funky Wife. Jason lives in the beautiful laid back "dullesville" city of Perth, Australia. 100th day of the Global Corporate Challenge! Made a controllable iPhone robot face! I lost 6 kgs in 2 months!